–is it possible to submit covers? – do NOT send me more than 1 cover at the same time. – include all CREDITS you like to see on the shout-out. Due to the large volume of emails I am not able to respond. However, I do read all of them and appreciate everything you submit. Thanks! 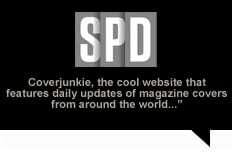 –Is there a commercial reason for Coverjunkie? No, nooo, everything on Coverjunkie is there to celebrate creativity. There are no banners or any other means to exploit this. I choose to keep my credibility, it’s all done out of love for magazines. –Can i receive a newsletter? Nope, Coverjunkie is an addiction and i do the blogging on my own. It’s independent and all about loving mags. If you like read more here about me as founder and what this site is about .